When The Two Jakes opens, Los Angeles isn’t the dreamy desert town it was in the 1930s, and private investigator Jake Gittes isn’t the man he was in Chinatown. The city has since exploded with a post-WWII boom of soldiers returning home ready to start a family. This means they’ll need houses, which means land deals must be made. Therefore roads must be built, because how else are buyers going to get to their land? And how will they travel if not by automobile? And since cars run on gasoline, oil must be drilled. Observing the 1940s cityscape, Jake remarks how oil rigs outnumber the palm trees and fruit stands have been replaced by filing stations. Indeed, there’s a small rig pumping just outside of his office’s front door. Jake too has changed, his reputation now established in town as “the leper with the most fingers”. He’s grown prosperous, comfortable, and a little round; he has a fiancée and rarely does he snap photos of adulterers under the sheets anymore. Jack Nicholson reprises his original Oscar-nominated role and also directs this 1990 sequel to Roman Polanski’s masterpiece, but his picture, received with lukewarm praise, proved a box-office bomb and a major disappointment for Paramount Pictures. 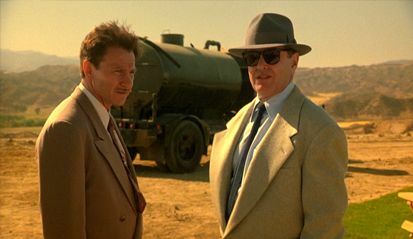 Variety used words like “convoluted” and “imperceptible” and “obtuse” to describe the plotting, while Nicholson’s neo-noir direction was, on the whole, met with indifference. It’s a film whose reputation as a troubled production soured its initial release and has since never received its due praise, if only because, how can a sequel released sixteen years after-the-fact hope to compete with a timeless original, long established as one of the very best films of the 1970s and beyond? Enough time has passed now that, when viewed with some space after a screening of Chinatown, one can appreciate Nicholson’s control on and off the camera, as well as the dimension he brings to these familiar characters and their world of conspiracies, infidelity, and a past that won’t let go. 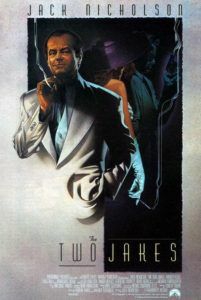 Written by Robert Towne and dripping with forties noir atmosphere, The Two Jakes doesn’t just embrace its backdrop; like Polanski’s film, it transcends whodunit limitations to go deeper into its characters and moreover, like the best sequels do, enhance the original. Much like Chinatown, the story of the sequel’s inception begins with producer Robert Evans, whose wild, self-aggrandizing reputation earned him the nickname “Kid Notorious”. Well-worn by 1980s after a series of flops (including Francis Ford Coppola’s Cotton Club), the former self-proclaimed golden god of seventies cinema had multiple run-ins with the law, having been peripherally involved with high-profile cocaine and murder cases that were enough to tarnish his reputation beyond repair. (It’s all very colorfully detailed in his autobiography, The Kid Stays in The Picture.) 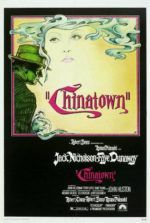 Wanting to help Evans, Nicholson agreed to star in a sequel to Chinatown, which was to be an auteuristic breakthrough for Towne as a writer-director, whose only directorial credit at this point was 1982’s Personal Best. Evans, too, was set to make a comeback, not only as producer but as an actor, playing the second Jake of the title. 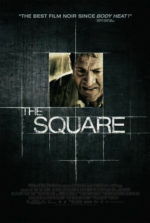 Instead, Towne fired Evans not long into shooting and soon the production was scrapped altogether. Towne moved on and made the passable beachside noir Tequila Sunrise (1988). Not until the release of box-office smash Batman in 1989, after which Nicholson’s status alone seemed to spin gold, could he restart the picture and helm The Two Jakes himself. The film opens in Gittes’ office, a luxurious space recalling Humphrey Bogart’s in The Maltese Falcon, with light shining through the blinds to create dramatic horizontal lines on the opposite wall and faces of those in the room. Nicholson narrates in pulpy rhetoric oozing with juicy metaphors and colorful imagery; he didn’t narrate in Chinatown because Polanski’s film was more than a pure exercise in noir style, but no matter. The voiceover fits well here, we come to learn, as this neo-noir delves further into Jake’s head, specifically with memories of Faye Dunaway’s late Evelyn Mulwray and her sister-daughter Katherine still rattling around up there. As for the other Jake, that’s Jake Berman (Harvey Keitel), a distraught housing developer who thinks his wife (Meg Tilly) is having an affair. Gittes and his associates have already arranged a walk-in where Berman will catch the two in the act, while Gittes and company record the confrontation on audio wire in the next room. Berman rehearses his lines like a bad actor, but when the moment comes, his jealousy prevails and he kills the other man. It all seems like an open-and-shut crime of passion, until the hysterical, bereaved wife (Madeleine Stowe) suggests there might’ve been a financial motive behind Berman killing his wife’s lover. Meanwhile, everyone from the LAPD’s Captain Lou Escobar (Perry Lopez) to Berman’s gangster friend ‘Mickey Nice’ (Rubén Blades) wants Gittes to turn over his office’s wire recording. But doing that would not only leave too many questions about Berman’s true motivations, it would leave Gittes unable to determine how Katherine, whose name is mentioned on the wire, is involved. Our hero still feels responsible for what happened to Evelyn, and perhaps he always will. Gittes isn’t one for forgetting the past, and Nicholson portrays him with a knowing sense of acceptance about himself—that the past will always plague him, but he refuses to forget nevertheless. In a way, he needs it, and it defines him. As a result, Nicholson’s performance isn’t the somewhat naïve character he once was; he seems to have learned from his mistakes, and he takes each (of the many) twists in the plot in stride. 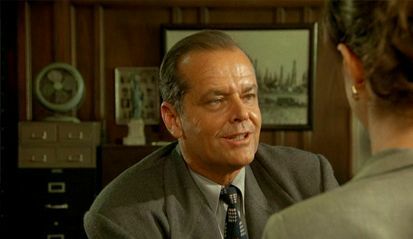 Having seen it all, his seasoned private investigator isn’t quite the nonchalant ego that defined Nicholson in this period—he isn’t merely playing the “Jack” persona—but he channels elements of his celebrity to enhance Gittes’ experience. In turn, The Two Jakes becomes less about uncovering a mystery and more about identifying the limits to which these two eponymous characters will go to protect what they care for, and how, different approaches aside, they’re both trying to protect the same woman. Had Katherine’s name not been mentioned on the wire, chances are there would be no film—and without her, what would either Jake’s motivation be? But from the beginning, when the two Jakes realize what their respective friends call them and that they’re both wearing the same style shoes, there seems to be a kinship between them that comes and goes throughout the film. 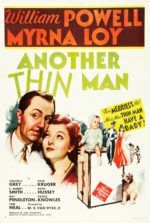 Along the way, Towne and Nicholson meander through pulpy murder, racy sexual exploits, comical run-ins with the police, and scandal galore. Following how one moment of intrigue leads to the next might take more than one viewing, but in the end the filmmakers bring the audience back with a surprisingly affecting scene between Keitel and Nicholson. 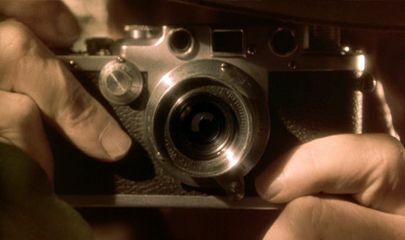 For those versed in the exhaustive detail of Chinatown, Towne and Nicholson have embedded references to the original (including two or three ungainly, albeit momentary, flashbacks): Gittes’ associate Walsh (Joe Mantell), now silver-haired with crystal blue eyes, serves as a moral register to remind Jake when he’s pushing even his limitations. And there’s at least one reappearance of an annoying “gate-keeper”: Remember the zit-faced twit behind the counter at the hall of records in Chinatown? Now he’s a notary public who’s earned himself a mouthful of metal for talking, but he’s just as snide as before. For the most part, however, the film seeks to expand on the character Jake Gittes, effectively touching base with him more than a decade later to see how he’s grown. Even with the theme of the past’s importance, The Two Jakes isn’t just a trip down memory lane. New characters and lively dialogue make for salacious noir-style storytelling, every moment made lustrous by Vilmos Zsigmond’s moody lensing. Fans of the genre will feel right at home. Watching The Two Jakes today requires some distance. If viewed straightaway after screening Polanski’s film, the vast differences between the respective directors’ stylistic approaches and period settings—not to mention a dramatically older-looking Nicholson—will prove distracting and incongruous. Put a week or month in-between the two films, and we’re allowed, if for just over two brief hours, to forget what a genius picture Polanski made, and instead concentrate on the polished, thoughtful noir Nicholson has made. To contrast these two films is unfair and meaningless; neurotically calling attention to the stylistic disparities between Polanski’s picture and Nicholson’s is what drove the sequel’s poor reception initially. Asking “What if Polanski had directed?” ignores what we were give, which is a smart, unexpectedly moving film that deepens the unwavering legacy of the original.